Removing a password from a document is a simple process, but you have to know the original password. Open the document and enter its password. 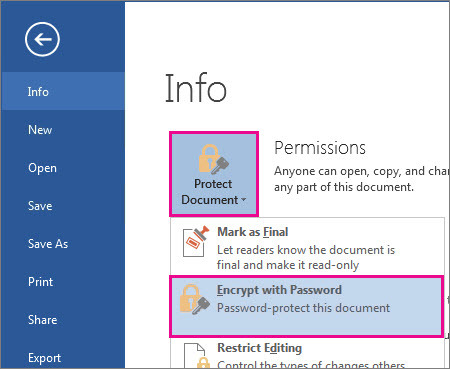 Click File > Info > Protect Document > Encrypt with Password. Clear the password in the Password box, and then click OK.
Passwords are case-sensitive. Make sure that the Caps Lock key is turned off when you enter a password for the first time. If you lose or forget a password, Word can’t recover your information so it might be a good idea to keep a copy of your password in a safe place or create a strong password that you’ll remember.